As the pharmaceutical industry continues to accelerate its focus on developing biological drugs derived using cell culture processes, the ability to accurately monitor osmolality throughout each phase of development, production, and finished product quality control (QC) becomes increasingly important. Osmolality is arguably one of the most important physical parameters to monitor in mammalian cell cultures because of its fundamental implications to the growth, viability, yield, and the close relationship between cells and media. Freezing point osmometers are considered the gold-standard method in the pharmaceutical industry because of their accuracy and broad applicability for almost any liquid sample type, including complex media mixtures. The desirability of osmometer system features often can be remarkably different, depending on the research environment. Cell culture media optimization studies, for example, typically involve multiple experiments using smaller bioreactors. These studies generate higher volumes of samples from multiple reactors and multiple technicians when a small sample volume and quick result are required. Large-scale production bioreactor monitoring typically involves fewer samples, and sample volume and labor constraints are not an issue. Downstream applications for osmolality (including buffer preparation and QC for incoming raw-material inspection) add yet another layer of required features such as unique sample testing protocols and methodologies for a regulated environment. Common to all areas of biopharmaceutical manufacturing using osmometry is the need to improve automation and minimize labor requirements. To achieve that goal, Advanced Instruments has developed a new multisample fully automated freezing point osmometer. The A2O Advanced Automated Osmometer has been developed to combine state-of-the art osmometry technology along with a new feature set designed to improve automation and minimize sample-processing steps. 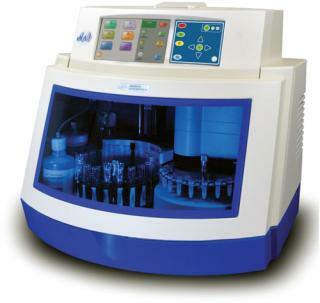 The A2O provides an automatic pipetting system with liquid-level detection capability. This allows operators to process multiple samples from the same sample tube without needing to manually pipette samples individually. Flexible sampling protocols and built-in QC parameters provide the ability to process up to 20 samples with unattended operation. In addition, the A2O provides a wide range of features that will provide immediate and far reaching efficiency and work-flow benefits to support all areas of biopharmaceutical research, development, and manufacturing. Kelly Peterson is the pharmaceutical product marketing manager for Advanced Instruments Inc, Two Technology Way, Norwood, MA 02062; 1-781-471-2193; kellyp@aicompanies.com; www.aicompanies.com.